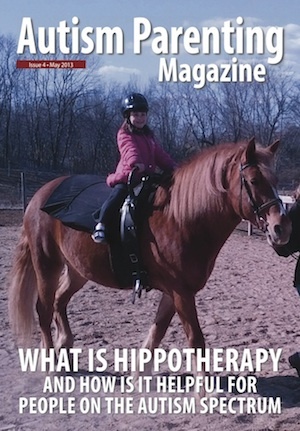 This issue features Hippotherapy and how it is helpful for children on the Autism Spectrum. This month we have chosen to have the theme of all things related to therapy and not just the conventional physical therapy, occupational therapy and speech therapy. While I am a big supporter of these therapies and have seen how helpful they can be for most kids, I thought that it would be interesting to get an inside look at other types of therapies that you may have heard about but probably haven’t had much time to research. In my interview with hippo-therapist Beverly Saddler, you will learn how she uses her knowledge and experience as an OT to help kids on the spectrum using horses. In the article, “Autism is Like a Cough” you can get an honest glimpse of what it’s like for a dad with a low functioning ASD child and his valiant efforts to keep trying all the options for his son. Then, the next article is written by Carl Young of www.whynotfathers.com and he explains his son’s stimming in such a perfect way that you might question if speech therapy is helpful or hurtful in this particular situation. Next, we are happy to feature a story about social therapy from the Friend 2 Friend Centre. After learning some strategies on how to help your ASD child make friends, you can remind yourself that when making a “plan” to care for your child (or children) that planning breaks for the parents is crucial not selfish. In the news section, we explain how it has been scientifically proven for ASD kids to interact socially in the presence of animals. Also, since April is Autism Awareness month we shared a list of important dates and events. I am looking forward to speaking at the FOCUS Center for Autism Dinner. Make sure to check out the Q&A section because it has some great information on IEP’s. Many thanks to the people who shared their stories to help us smile, laugh or just to be happy and relate with you. I hope you read our Food For Thought Section even if you don’t have a problem with eczema, I think it is important to stay informed about what we put in our bodies. Have a great month. Description: Everybody’s autism varies and everyone responds to therapies differently. Description: Stimming isn’t always flapping of the hands or arms. Different strokes for different folks. What is your child’s stim? Description: A Brief Moment in Time is a powerful and heartfelt memoir sharing French’s perseverance through adversity, revealing how she overcame her own prejudice, denial and pain to secure a happy future for her family. It is a portrait of an inspiring woman that will assist and shed light on the plight of others who may be starting their own journey on this road. Description: Can I put organizational/study skills in my 9 year old son’s IEP? Description: Inspiring and sometimes funny things are children say, do and achieve. Food for Thought: KID’S FOAM MATS, Food & OTHER PRODUCTS: BANNED IN EUROPE, BUT NOT IN THE USA OR CANADA, WHY? I wanted to reach out to you in regards to this post. I am a senior standing at Cal Poly Pomona and before we graduate we must conduct some research on a topic that interest us. I happen to choose the effects of Hippo therapy on children with autism and I came across your magazine. May I ask you a few questions in your findings when interviewing Beverly Sadler? Did you know anything about this type of therapy prior to conducting your interview? Can you see or have you or Beverly seen the positive and negatives in Hippo therapy? If you would do more research or interviews where would you begin to research? Why? I understand that these questions are fully loaded and if you do not wish to answer I would understand 100%! I am very excited to hear back from you and your experience with kids with autism using hippo therapy. I can’t thank you enough in taking time out of your day and helping me finalize my senior project. I am also open in doing a phone interview. Nice blog about babies’ problems and it really help them out who have babies. Thanks for the article. You’re welcome. Feel free to check other helpful articles here: https://www.autismparentingmagazine.com/autism-article/.